50th Anniversary of The First Acid Test and shocking news from the Grateful Dead Archives! 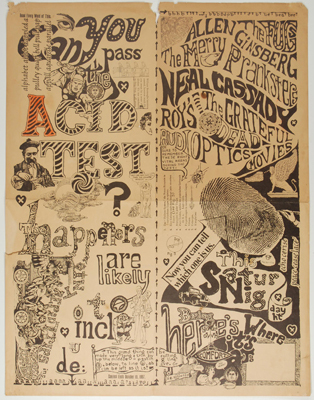 Fifty years ago, on November 27, 1965 the Merry Pranksters conducted the first Acid Test at Ken Babb’s place in Santa Cruz, California. This event served as the catalyst for tectonic shifts in American music…culture…and just about everything else! The bottom line is that the historical significance of the Acid Tests of this era simply cannot be overestimated. So it is for very good reasons indeed that all posters, handbills and other ephemera from these events are among the most desirable of all 1960’s collectibles. Because these items are the artifacts of a scene and a movement in it’s embryonic stages, precious little of it was produced at the time and even less survives today. It goes without saying that the addition of any Acid Test material automatically catapults a collection into the category of World Class. The well known collectibles journalist Ben Marks published a phenomenal article on the Acid Tests, and the early days of the Grateful Dead, in commemoration of this 50th Anniversary. It is highly recommended that anyone with even a passing interest in 1960’s concert posters should read Ben’s article….TWICE!! While compiling the research, Ben blew the lid off an amazing revelation that is not commonly understood. Nicholas Meriweather, is the official archivist for the Grateful Dead at the McHenry Library at the University of California, Santa Cruz. In the article, Meriweather is quoted as saying, “the archive doesn’t really start until 1970, because the band didn’t incorporate until that year. We’ve got a few things from before then, but precious little. Nothing would please me more than to be able to say ‘come on down, and I’ll show you my Acid Test trove. Sadly, I don’t have one! This to me, is an amazing statement and simply reinforces how privileged all of us are to be participating in this hobby at this moment in time. As collectors, it’s easy to become jaded about the availability and desirability of a collectible that you work with on a daily basis. But when the chief Grateful Dead archivist tells you he has precious little pre-1970 material, that is a statement that needs to be fully digested and considered for all it’s vast implications. I will leave it to each reader of this blog to come to your own conclusions, but this simply strengthens my belief that pre 1970 concert memorabilia is the number one collectibles opportunity in the world today.